Here's how I got started developing on a Microchip dsPIC33F. I wanted to speed up the flame-detecting vision system on Pokey from 3fps to 30fps by upgrading from an 8-bit, 20MHz ATmega328P to a 16-bit, 80MHz dsPIC33F. The main performance boost comes from the dsPIC's very fast ADC. I chose a dsPIC33FJ128GP802-I/P in a 28-PDIP package. It features 128KB flash, 16KB RAM, 16 remappable pins, a bunch of peripherals, DMA, and 1.1MSPS 10-bit ADC, among other cool features that make it a good choice for a low resolution grayscale vision system. 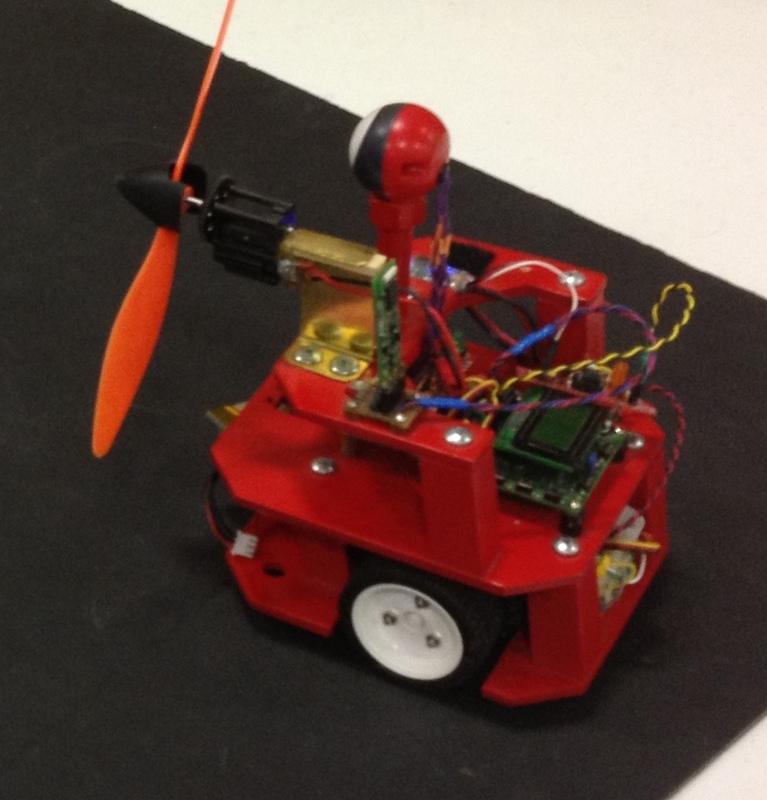 If you're just starting out, this Dangerous Prototypes Introduction will be quite helpful. I'll cover some of the same stuff in this post. I'm using the MPLAB IDE v8.6.0 which features a pretty familiar interface not unlike AVRStudio, Netbeans, Eclipse, IAR EWARM, and the like. 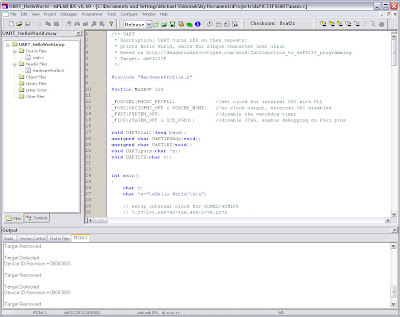 The IDE features workspaces in which you develop projects. The left panel features a file explorer for the workspace. The bottom panel features various types of output. Code is written in the big panel. Toolbar buttons are used to build code, program the MCU, manage files, project, and perform other routine tasks. As with AVR Studio and other standard IDEs, you can double-click on compiler errors to find the offending source. Turning on line numbers is helpful, sometimes. Select Properties from the Edit menu, click the 'C' File Types tab, and click the Line Numbers check box. I'm using the PICkit3. I took advantage of promotional pricing at the time. I figured, why hassle with a clone when I can increase my chances of success without spending much more. They now cost around $45 so it's not exactly a bargain but it's acceptable compared to other programmers (I'm thinking particularly of the JTAG ICE MkII I've been using). You could also get a Microstick for the dsPIC which has a built in programmer and debugger and costs $25. Taking baby steps, first is breadboarding the dsPIC. The hello world programs will come after that. In the picture above, Pin 1 is the lower left. That's the !MCLR (reset) pin. Note the tiny 10K pullup resistor, partially hidden. Pin 8 is VSS (ground). Pin 13 is VDD (3.3V) with a 0.1uF decoupling capacitor installed. Pin 28 is the AVDD (analog 3.3V) pin, 27 is the AVSS pin (the brown ground wire is hidden somewhat). I put a 0.1uF decoupling capacitor here, too. The 10uF capacitor at pins 19 and 20 bypass VCAP to VSS. And that's all you need. You don't even need an external crystal, although you could use one. To program the chip you need power. I've used a Sparkfun FTDI breakout to provide 3.3V. It is also connected to UART1 which is setup for transmit on pin 25 (PB15), receive on pin 24 (PB14). To program the device, connect the PICkit3. Pin 1 with the arrow connects to !MCLR, the green jumper above. 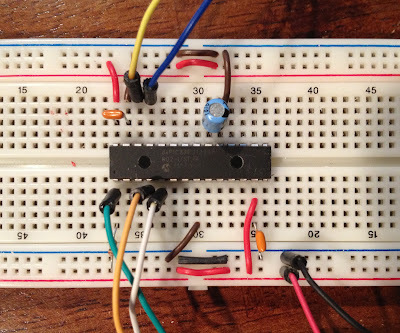 Pin 2 is target VDD (telling the PICkit3 if the device is working), the red jumper at the bottom of the breadboard. Pin 3 is VSS, the bottom black jumper. Pin 3 is PGD (PGED1, dsPIC pin 4), the orange jumper. Pin 4 is PGC (PGEC1, dsPIC pin 5), the white jumper. The first version of Hello World for an embedded system is blinking an LED. You can learn a lot about an MCU just by getting it to that point. An AVR is dead simple, an ARM7 like the one on my LPC2103 breakout board, is a nightmare--it took days. The dsPIC33F is pretty easy. The dsPIC uses an interesting method of configuring the clock source, PLL, watchdog, and other options. One places a set of statements before your code. Then, in the main() routine, one sets up the PLL multipliers and divisors. The following code shows setting up a dsPIC33F for 80MHz operation. Three registers control GPIO on the dsPIC. A tri-state register, TRISx, controls direction, a latch register, LATx, and a port register, PORTx. You can write to the PORTx register which writes to the latch, or you can write to LATx directly. Reading from LAT reads the latch, reading from PORTx reads the actual pin state. On the dsPIC33 I'm using, there's an A and B port. So you'd use TRISA and TRISB, PORTA and PORTB, LATA and LATB. Let's use RA0 for our LED. All pins start out as analog inputs after a reset. To disable the analog functionality of a pin, write a 1 to the corresponding bit in the AD1PCFGL register. Next, configure the RA0 pin as an output by writing a 1 to the TRISA register's bit for RA0. In C, use TRISAbits.TRISA0 to reference the A0 bit of the TRISA register. In general you can reference bits of any register like this. To turn the pin on, write a 1 to TRISAbits.TRISA0 To turn the pin off, write a 0 instead. You can toggle a pin using LATAbits.LATA0 = ~LATAbits.LATA0. 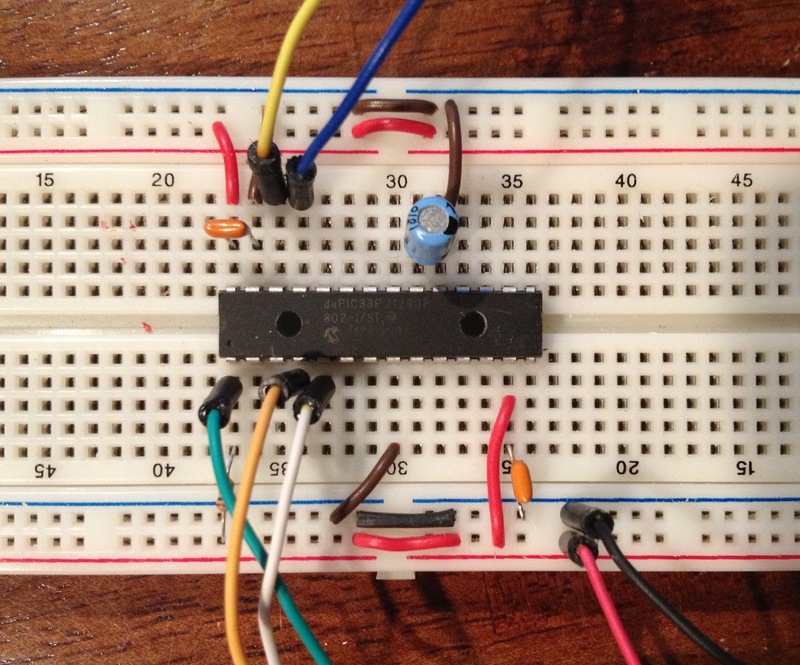 If you want to blink an LED in a simple loop you need a delay. Ideally one that is carefully and correctly timed. Microchip provides such a function, and macros, through the C30 compiler. In the C30 compiler directory under the folder src, unzip the libpic30.zip archive to the folder pic30 and find delay32.s. I copied this into my project folder. I also had to copy null_signature.s in as well. Then, add both files to the project source. Then, in your C program, define FCY the instruction cycle frequency. If you're running a high frequency, define this as a long long. After this definition, include libpic30.h Finally, you can call __delay_ms() with an integer parameter representing the number of milliseconds to delay. Other functions include __delay_us() for microsecond delays and __delay32() delays the specified number of instruction cycles. The second version of Hello World actually prints the string "Hello World" over a serial connection. I like to play with UART next as it's useful for debugging, and you can learn a little about the MCU's peripherals without too much complexity. Set up the pins, the baud rate and maybe a couple other options, and then start sending data. Setting baud rate with the UART peripheral can be done using the high precision baud rate generator for higher speeds or the low precision generator for lower speeds. Select which to use via the BRGH bit of the UxMODE register. Set it to 1 for high precision, 0 for low. For the high precision generator, baud rate divisor, UxBRG, is calculated by (FCY/(4*baud)) - 1 where FCY is the frequency of the instruction cycle clock. Once baud rate is set, clear the status register, UxSTA, enable the UART with the UARTEN bit of the UxMODE register, setting it to 1. Finally, clear the receive flag, UxRXIF bit of the IFS0 register. You're not quite ready. The dsPIC offers a really cool capability, namely, mapping any peripheral to any pin. Even the ARMs I've worked with can't boast that kind of flexibility! So, let's setup pin 14 as the UART receive pin, and 15 as the transmit. 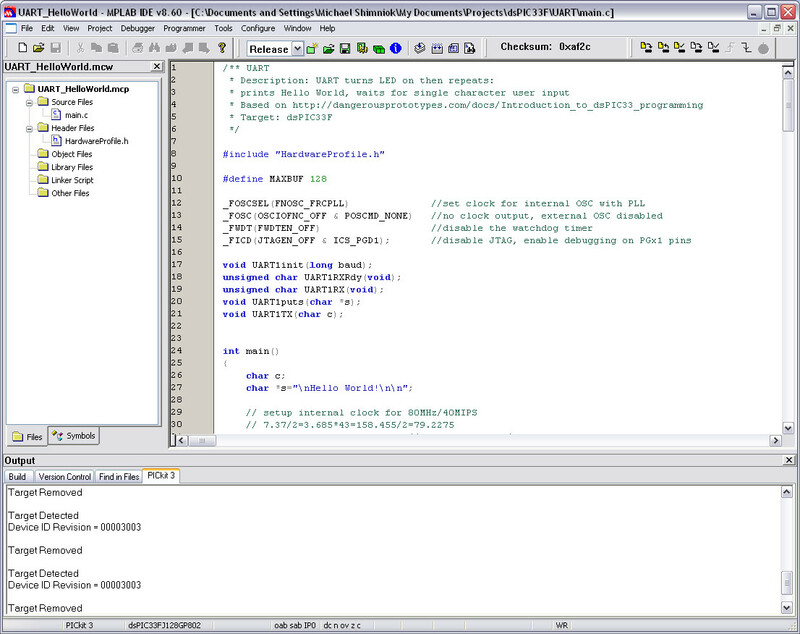 Set the pin assignment in the UxRXR_I and UxTX_O registers, respectively. Finally, you're ready to send and receive. The bit U1STAbits.URXDA indicates data is ready to be read out of the U1RXREG data register. When it's time to transmit, put a byte in the UARTxTX register to send it. Here's the code to do all the above. So, that's about it. I'll post more articles as I progress, featuring other peripherals, tips, and tricks, and the like.